The safest place for a plant during a drought is in a container in a slightly sheltered location that keeps it out of the hot sun. Ideally the location should also be near an outdoor faucet which has a hose hooked up to it so that the gardener can water the plant the minute it looks like it might need a little drink. 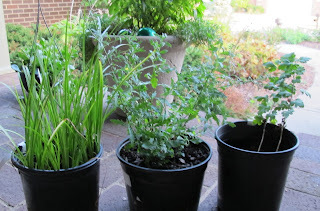 In my garden, there are three plants in containers that occupy such a location. I check them daily but I try not to fuss over them. I know you can kill a plant with kindness just as quickly as you can kill a plant with neglect. These three plants are special. 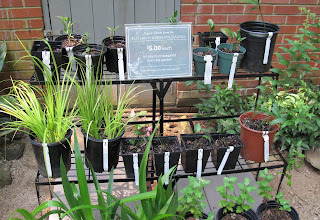 I was thrilled to see that they were selling a few plants that had been propagated from the plants Lawrence grew in her garden. At first I wasn't going to buy a plant because I was heading to the beach for a week's vacation before going home, but in a matter of a few seconds I came to my senses and changed my mind. Acorus gramineus 'Ogon' - Japanese sweet grass. I'm going to have to think about where to plant this one as it likes a wet location. Currently my garden has no location that I would consider wet, especially during a drought, but I'll figure out something. Kalimeris pinnatifida ‘Hortensis’- Oxford Orphanage Plant. I first read about this passalong plant when Allen Bush wrote a post about it for the Human Flower Project website. He met Lawrence in 1982 and she gave him a start of it. When I read that article, I immediately ordered this plant for myself, but that plant got lost in the shuffling of plants that took place when I re-planted several garden borders a couple of summers again. Andrea was very accommodating in making sure I went home with this plant when I asked her about it. Chrysanthemum 'Christmas Gold' - Andrea wrote an article about this Chrysanthemum and how it blooms late in the fall. I'm sure this is one that Lawrence also passed along to others because Chrysanthemums are easy to share. I suspect if I look for them, there are some references to to this particular Chrysanthemum in her writings. 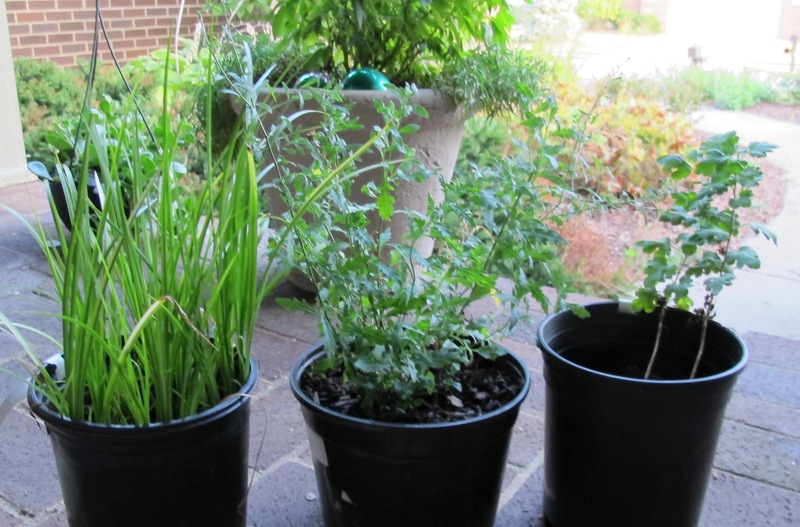 All three plants are safe right now, on the front porch, sheltered from the hot sun and near a good source of water. They are waiting for me to find them more permanent planting places, once the drought is over. My hope is that once I plant them in my garden, they will flourish and spread. I hope, too, that as the years go by, I can share divisions of these plants with others who visit my garden. "Here, have a start of Chrysanthemum 'Christmas Gold'. You'll love it, even if you don't like mums. I insist. 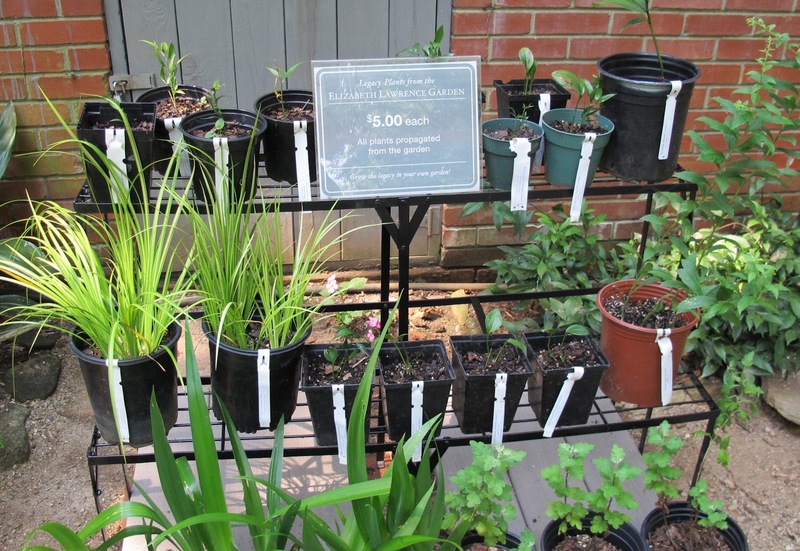 I got my start from Elizabeth Lawrence's garden." Doesn't that have a nice sound to it? You are a wise gardener, Carol, and congratulations on getting those prize plants home safe and sound. I grow the acorus, for the pond, and planted some in the ground when they got overcrowded. They did so well that is the lawn substitute in the entire yard in front of my house. They are quite drought tolerant and love to be divided. Good luck with your newbies! Carol - what wonderful remembrances - of a wonderful trip and a great gardener. I think it is wonderful when we passalong a plant along with an extra bit of its history. You bet that has a nice ring to it. I know you would have been so disappointed with yourself if you had come home without some of those plants. They will bring back so many memories every time you stroll through your garden and see them. Perhaps you should plant them where you can see them from your library. How wonderful that these plants made the trip home safely. I know you're going to treasure these, and they'll always be a reminder of your visit to Elizabeth's garden. By the way, we've only had a little bit of rain now and then, and every time, I suggest to the winds to blow it southeast to both you and Lisa. When the forecast is for possible rain, I quickly check out the weather radar map, but most of the storms go north of us or fizzle out before they get to my area. I wish I could send some your way, too. Wow, that was close....so glad you came to your senses. LOL Cannot wait to see pictures of where these plants land in your garden. Enjoy! I'm sure Elizabeth Lawrence would be delighted that her garden grows in Indiana now! I'm so glad you "came to your senses" and bought those. You, of all people, need to have part of her garden in yours. I am testing this because I have not been able to sign in and post using my Google account and I want to comment on Elizabeth Lawrence. I love your Elizabeth Lawrence posts. Years ago I was writing an entry on her for American Women Writers (a reference work published by Unger) and I wrote to her to find out details and then to have her see the entry. I began by calling her "One of America's foremost authorities on Southern gardening...." She demurred,saying someone else is more important. Don't remember who--some Southern gentleman as I recall. During our correspondence, which is now in the Lawrence collection somewhere (LSU? ), I mentioned to her that I had been able to visit Lob's Woods, as she called Mr. Krippendorf's garden near Cincinnati in The Little Bulbs--and later wrote a short booklet on the garden after the Cincinnati Nature Center took over the property. She sent me a cutting from her garden of the lesser celandine, which she said had come from him originally. She also warned me it was very invasive, as it indeed is, covering part of my woods every April and wandering in to the rest of the garden at will. Still, I love it. A few years later I gave a talk on women garden writers at Wave Hill in NYC and a member of the audience volunteered that she was a relative of Mr. K. and spent her honeymoon on the Lob's Woods property, at the lodge house. Her letters were handwritten in a very arthritic handwriting (although better than my current arthritic handwriting), and I cherish them--of course I made copies of them before I sent them off. I never had a chance to visit her garden but love reading your posts about it. And I can so relate to the way you open this piece, on where plants are safe in a drought, as I have been moving as many of my containers as possible into a shaded spot during bad heat, and even planted a container for my fenced vegetable/hydrangea garden (deer). P.S. in answer to your test of July 23, I am a sympathetic gardener and also a bit glad to see that MY toad lilies are in better shape. About the squirrels, I did not know they ate tomatoes. They are fairly recent here--gray and a few white--and besides eating the corn cobs we put out for them, they are right now eating the old Bartlett pears on the very old tree next to my bedroom window, where this morning I watched a gray one deliberately and it seemed to me gratefully eating a large one. The other day we missed a chance to photograph one of the white ones posing very nicely as he ate. Editing error--somehow the word "she" disappeared from the sentence, "and later she wrote...."
Alphonsegaston (Beverly Seaton), Thank you for the wonderful comment. Your additional information makes me want to get some lesser celadine for my garden. I have also visited Lob's Woods just a few springs ago and imagined what it was like when Eliz. Lawrence visited Carl K there. I know if you get a chance to visit Eliz. Lawrence's garden, you'll do so. Every gardener should! Ah, you want some lesser celandine? Sure? Let me see if I can find some: not a joke, it disappears in midsummer. If so, I can pass it on! As for my visiting Elizabeth'g garden, alas, my 78 years forbid by travelling, which is why the garden blogs are such a joy to me, along with my own 40-year old garden in the central Ohio countryside.